Krummenacher and Gradinger ready to fight in Europe! Randy Krummenacher and Thomas Gradinger are looking for top results, starting this weekend at the MotorLand Aragon circuit! Randy Krummenacher (BARDAHL Evan Bros. WorldSSP Team) and Thomas Gradinger (Kallio Racing) talk about the first European round after the overseas rounds in Australia and Thailand, and how they are currently shaping-up in the FIM Supersport World Championship. 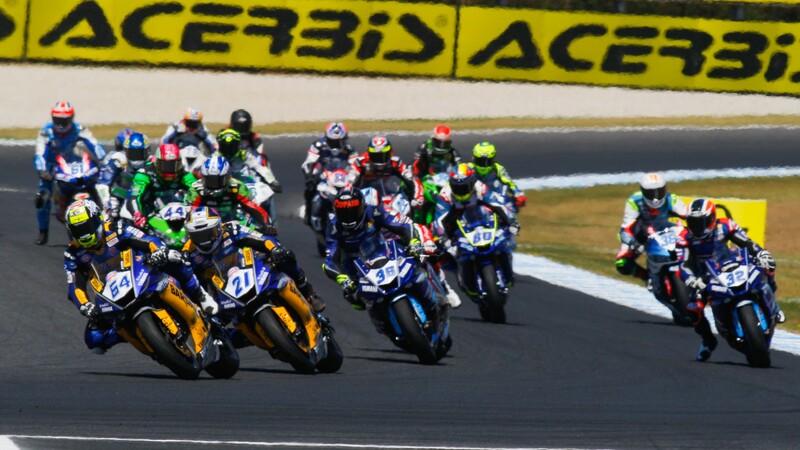 The first races of the WorldSSP in Australia and Thailand are history, this coming weekend the first race on European soil is on the calendar; the Motocard Aragon Round from 5th to 7th April at the Spanish MotorLand Aragon venue. While Randy Krummenacher is coming to Europe together with Jules Cluzel as world championship leader, Thomas Gradinger, in 12th place overall, is still not quite where he would like to be after a promising Australian round. Randy, what is your summary after the first two races overseas? "The summary is that this year we have a very strong package, which allows me to confirm all my skills to 100% in results. That's great and we're working hard to have a decent say in the race for the title." Thomas, it has been mixed for you; what is your summary after the first two races? "That's right, it could definitely have gone better. Even if we had a lot of bad luck, we made a few mistakes ourselves. The positive thing we can take out of it is that we can ride with the front guys and we're sure to be in a good position for the next races." And what is it like to start in the World Champion team and to have a leading position in WorldSSP in the second year? Thomas Gradinger: "For me, it does not matter if the team has become World Champion, of course it cannot be a bad team if they have become World Champions, but in the end I have to do my job, what happened in the past does not count. Collaboration with the team works really well, even with the teammates, we get along well, everyone gets the data from the other to look into and compare and there is no stress. It works really well with my boys and we've already found a good level on which to work. In addition, I see it so that none of us has a number one status, they are are all the same and of course, I am no longer a rookie and must now deliver better results than last year. I do not feel any pressure from the team, I tend to do it more to myself." With the race on the MotorLand Aragon in Spain, the European season starts this weekend. The "overseas stress" is gone. What does that mean for you personally? Randy Krummenacher: "The overseas stress is finished but I like to ride overseas. Of course, after two very strenuous races where the Australia trip is very long, and it is very hot in Thailand, I am now happy to be back in Europe at the start and to enjoy the normal Europe, where I am at home and have only short journeys." Thomas Gradinger: "I like the overseas races, even if traveling is not easy. I do not have too much stress, even if the climatic conditions and jet lag is a bit stupid compared to Europe. Of course, I'm looking forward to it when the races are not so far away and it's easier to get to places. You're also home faster too!" How are things going in Europe? Can the Swiss rider compete against Jules Cluzel at the Motocard Aragon Round and take the outright lead in the overall standings, and how will Austrian Thomas Gradinger improve, as he continues his pursuit to be the first Austrian rider ever to achieve a WorldSSP podium! All of the races from the opening European round at the Motocard Aragon Round can be enjoyed with the WorldSBK VideoPass!